Mark McClean is a British-born, New Zealand-based multimedia artist and design technician. 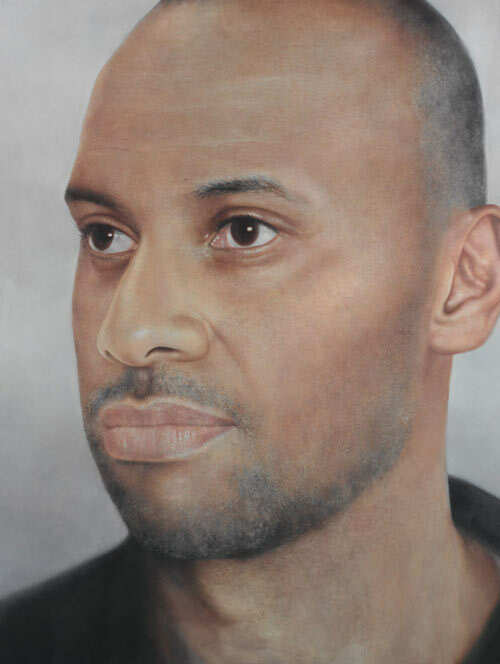 Martin Ball’s portrait of him is one of an on-going series of large-scale portrait paintings of friends and colleagues. Born in Auckland in 1952, Ball is known for his hyper-realistic paintings and drawings. He has been the senior lecturer in charge of painting at the University of Auckland, Manukau School of Visual Arts since 1995. Although early works included subjects influenced by American pop artists and still-life painting, he has always been interested in portraiture. He began to focus on portraiture in 2000 with an exhibition of five large-scale portraits of artists. Since then, Ball has continued his investigation into portraiture and scale and the resulting effect on viewers. He has had regular solo exhibitions in New Zealand since 1975 and has been represented in numerous group exhibitions including the 2005 Archibald Prize, in which he had a portrait of New Zealand artist and poet John Pule.